Click the 'Preferences' toolbar button ( ) or select 'Preferences' from the 'Tools' menu to change Paralog's settings. Units: Use metric or imperial units. Display Speed as: Use km/h (mph) or m/s (ft/s) for speeds and m (ft) or km (mi) for distances. Display Glide as: Use Glide Ratio or Pitch for the glide angle. Custom Fallrate: Sets the custom fallrate for automatic calculation. 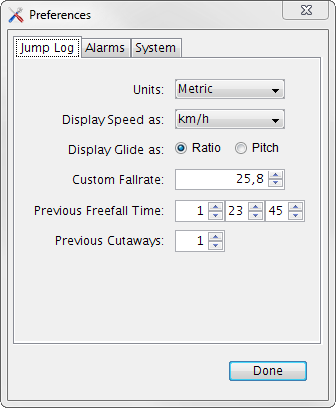 Previous Freefall Time/Cutaways: These values are added to the totals in your logbook to calculate absolute totals. 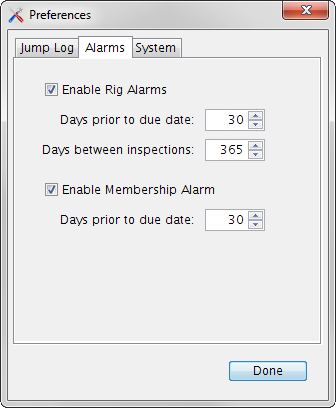 Rig Alarm: Show upcoming gear inspections/repacks on startup. Days prior to due date: How many days in advance should the warning be displayed. Days between inspections: How many days an inspection/repack is valid. Membership Alarm: Show upcoming expiration of your membership/license. Note: It remains your responisibilty to track your reserve, license and insurance validity! Backup Database: Backup the logbook when saving changes by appending a numerical extension to the last version of the logbook (e.g. PL-JumpLogDB.pmz -> PL-JumpLogDB.pmz.1400074151850). It is recommend to keep this option selected. Logging Level: Paralog can log internal status information to a log file. It is recommend to set this option to 'Off' unless told otherwise by our support. Image Size/Qulaity: When you add an image to a jump, the image is resized and copied to the logbook. This settings determine the size and quality. 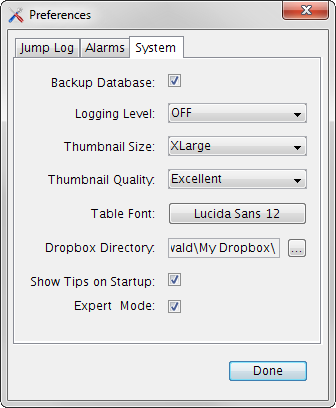 Table Font: Font used for the jump table. Dropbox directory: If Paralog can not determine the directory automatically, you can set it manually here. Expert Mode: When checked, most beginner tips will be suppressed and advanced customization dialogs will be enabled. Show Tips on Startup: When checked, Paralog will dispaly helpful tips on startup.